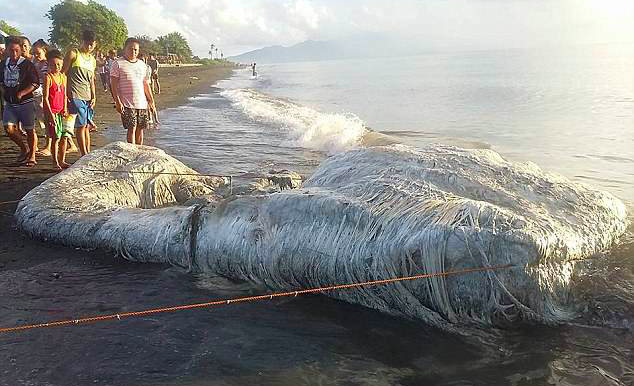 A huge hairy sea creature washed up on a beach in Oriental Mindoro has left locals fearing an earthquake is imminent. The mysterious 20-foot-long creature surfaced in the town of San Antonio at about 7pm on Friday (May 11). Villagers flocked to see the enormous carcass of the ‘globster’ — an unidentified organic mass — and pose for selfies. Marine workers took samples from the strange creature, which is four feet wide at one end and two feet wide at the other. They said the greyish white blob smelled “awful” and like “something from another planet”. And some residents expressed fears that the dead animal was a warning that a natural disaster might be imminent. Mother-of-two Imelda Mariz said: “I couldn’t believe what it was, I’ve never seen anything like it. In God’s name, I was shocked. Government workers are due to dispose of the creature, which is thought to be a mound of decomposing whale flesh. Fishery Law Enforcement Officer Vox Krusada said: “For now we can say it is a whale, but the exact species is still unknown. “The tissue samples are now sent to our lab for DNA analysis. The local government of Gloria will now bury the carcass. “It smells awful. It smells like something from another planet. I really experienced the full power of its smell because I’m the one who took the tissue samples. I almost puked. As we previously reported, a similar ‘globster’ washed up in the Philippines in February last year. Officials believed the beast, which was found off Dinagat Island, was an orca or a sea cow. I think that’s decaying connective tissue, not hair.